Sure the San Jose Sharks boast players like Joe Thornton, Patrick Marleau, and Brent Burns, however, their most effective player during the 2016 Stanley Cup Playoffs has been right winger Joel Ward. Having played against the Penguins consistently for the past four years before signing with the Sharks in the offseason as a member of the Penguins rivals, the Washington Capitals, Ward knows darn well what competing against Pittsburgh requires. Ward has scored six times and added five helpers for 11 points during the San Jose's 2016 Stanley Cup Playoffs run. His goals have been timely, like his two goals in Game Six that helped sink the St. Louis Blues and help the Sharks get to their first franchise Stanley Cup Final. Ward has a history of being a good playoff performer and scoring huge goals. 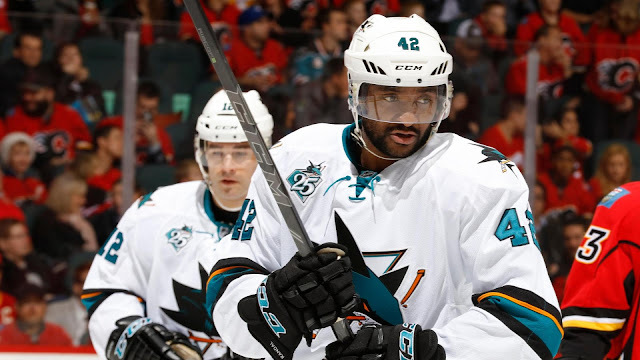 Joel Ward famously scored the series clinching Game Seven overtime goal in the 2012 Stanley Cup Playoffs Quarterfinals as a member of the Capitals against the Boston Bruins. Joel has recorded 20 goals and 26 assists in 71 total Stanley Cup Playoff games in his career. His career 12.1 regular season shooting percentage has been ramped up to 16.1 percent in the Stanley Cup Playoffs. Ward makes his shots count. So yes, the Penguins will have to keep tabs on Thornton, Marleau, and Burns but if you think that's all they have to worry about, you might be in for another big surprise.